We’re finally in New Orleans settling back into our house again and trying to get used to having so much space and clothes!!!! I’ll write more once we get thoroughly back in the swing of things and our friends stop asking us to go out every night. Friends! We have friends, again! Life is good. Since I provided readers with a mini-guide to Kalispell, Montana tourist attractions and general living advice, I asked the Southerner to do the same regarding fishing in Kalispell and its surrounding waters. 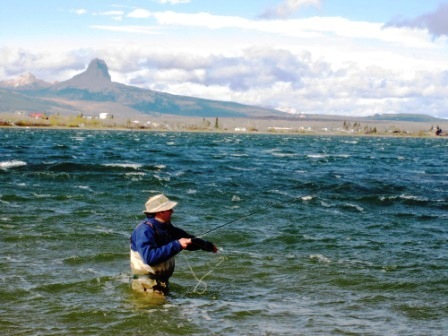 When the Yankee (if she can refer to me as the Southerner, then I can call her the Yankee) and I moved to the North-West corner of Montana to fly-fish for the summer, I got the expected comments from those who know about fly-fishing. While this is partly true, it’s an over-simplification. If you left it at that, and ignored the North-West part of the state, you would miss out on some incredible, and un-crowded fishing. Catching cuts is a blast. You use dry flies all the time. The fish fight hard. And with a little creativity and flexibility you can catch all kinds of trout…and big ones too. There are great big trout up here. Trophy trout. Trophy trout you can catch. Pictures of which, provoked my brother to state, “those are as big as the ones you see mounted in the restaurants and bars.” Warms my heart to hear such words. 1. The Blackfeet Indian Reservation (90 miles but everywhere in Montana is an hour away)–I’ve been fishing here since I was a kid. It’s rugged, but the fish are huge. The famous Duck Lake is the head-liner but there are another three dozen lakes that boast growth rates of an inch a month. The lakes are a tad alkali and so choked with scuds, leeches, and other insects that they measure trout in pounds, not inches. This fishing is not for those used to being warm and comfortable. Lying just on the east slope of Glacier National Park, the rez is one of the windiest places in America. They are rapidly constructing multiple wind farms. A typical day has you fishing in 30 mile an hour winds with 40 mile an hour gusts. Fishing in white caps is the norm and the occasional top of a wave being ripped off and splashed into your face is to be expected. Don’t believe me? Well, you will when you see the wind screens on the sides of the rail-road tracks to keep from blowing the trains off the tracks. You can fish here on your own, but I highly recommend a guide. Buckskin “aka David Parsons” is an outfitter(Cutbank Creek Outfitters) who has been fishing the rez for forty years. He has several great guides (ask for Joe Spotted Eagle). They provide the boat, lunch, knowledge of the best lakes to fish given the year you go, the time of year, the temperature, and the wind. They also know where in the lake to fish, the tackle to use, and the bugs. For instance, I caught ten rainbows over five pounds one day stripping a leech with an intermediate sink line over one particular bank on a lake a mile in diameter. That’s the only place they could be caught, and unless you have all the time in the world, hire a guide. I’d also recommend staying in East Glacier. The Whistling Swan (aka “farting duck”) is cheap and comfortable. There are several good restaurants (see previous posts). Browning is another option, but it’s pretty tough. You might get in a fight, you might not. 2. The Kootenai River–(90 miles) So yeah, this is where the small fish come in. Billed as a “Blue Ribbon” river, this huge tailwater is reminiscent of the Missouri or the Bighorn, except that it doesn’t have the nutrients to grow big trout. Well, I should say it doesn’t have the bugs to grow big trout throughout the river. Just below the dam, there is a mile of river with monster fish that have turned cannibal. They grow by eating pieces of fish that get chewed up in the turbines of the dam, then they start eating live ones. Sort of a Flesh-Eating Zombie Trout On The Attack kind of a deal. 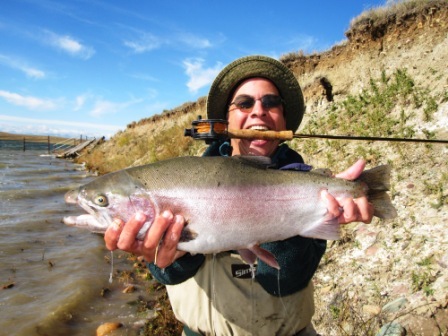 You can fish for them by casting a shooting-head and stripping huge streamers deep among the boulders. I’ve only done this for an hour and it was fun. Something crushed the four inch streamer I was quick jerking back to the boat. I didn’t set the hook though, and a resounding “Fuuuccckkkkkkkkk” echoed off the canyon walls until the streamer was all the way back to the boat. The beauty of the Kootenai, though, is that they don’t use nymphs…ever. So this begs the question. Is it better to catch 18 inch fish all day with nymphs dangling under bobbers or to catch 12 inch fish all day with dry flies? Everybody has a different answer to this question. For me, floating the Kootenai in relative solitude, dry fly fishing all day in a beautiful canyon, catching wild (no trout stocking in the Koot) trout every other cast is in there somewhere. Check out Dave Blackburn’s Kootenai Angler for great cabins on the river, a restaurant and bar with a pool table that you can walk to, and thirty something years experience. 3. Missoula–(90 miles, notice a theme here?) Trout Mecca. A full description is a book in itself. The Blackfoot, The Clark Fork, Rock Creek, The Bitterroot. Not much else to say. This is all primo fishing, and while you have to drive to it, it’s there and not too far away. I recommend The Missoula Angler and Mark Slayden for your angling and guiding needs. Also, the Golden Rose has a great poker game going most nights. Wanna be like Brad Pitt in A River Runs Through It? Play Front Street Poker all night in Missoula and then fish the Blackfoot the next day. Now for the truly local stuff. While you can get to all the above on the weekend, these are the spots for a quickie in the afternoon. 4. 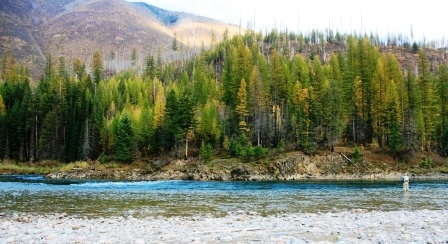 The Flathead River–There are three forks that form the river. The North, The Middle, and The South Fork. Then there is the main-stem that flows from Columbia Falls down through Kalispell and empties into Flathead Lake. A guided trip on any of the forks or the main-stem gives you a good chance at fifty fish days. There are some rainbows and browns in here, but mostly you get cut-bows (the cut-throat-rainbow hybrid). The scenery is beautiful and you have a great chance of seeing some wildlife. Both the Middle Fork and North Fork are easily accessible by road. We found a spot on the North Fork that we could be fishing at in twenty minutes from Kalispell. It had a riffle that dropped off into a series of pools and we invariably had ten strikes an hour there. 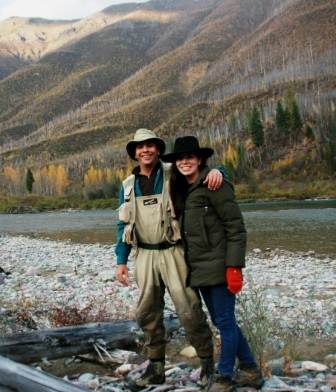 This is one of the prettiest rivers you can fish and other than a weekend in mid-summer, you will be in total solitude. Flies–Try the Purple Haze, Blue Coachman, and any colored Humpy in sizes 12-16. 5. Swan River–It has its good years and bad years. We only fished it one day, but there are a plethora of accesses and it is wadeable at flows below 700 cfs. 6. Thompson and Fisher Rivers (40-60 miles)–both have great reputations and hold nice trout. Plenty of access along forestry roads. I recommend getting the USGS forestry road atlas to see all the possibilities, but a standard road atlas will get you fishing. 7. Mountain lakes—There are endless possibilities. Inquire at the local fly shops about specifics. There are many of these lakes that have larger fish and people seem happy to tell you about them. Surprisingly, most of the locals don’t fish all that often and are nice enough to direct you where the fish are. We lived in the area for three months and fished 32 days in that time. We never had to fish the same place twice. Even at that rate, I think it would take a few years to fish all the water I read or heard about that is within 90 miles of Kalispell. So don’t worry about the flock of sheep that think there are only 5 fishable rivers in Montana and they are all in the South. Good luck. Wonderful comments for anyone planning to visit Kalispell and Glacier Park. Since I’m a widower and often travel alone for fly fishing expeditions, your suggestions on places to eat and your fishing experiences are especially welcome. Keep up the great blog. Thank you so much, Bob. It’s always great to get feedback. You should definitely try Pescado Blanco if you get over to Whitefish. They have a great bar that you can eat at and it’s also great for meeting new people. I can’t wait to go back to Montana!